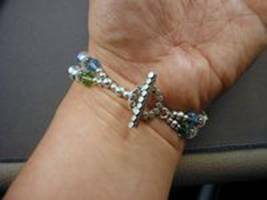 I made this gorgeous mommy bracelet for my good friend Suzanne when her second child Ruby was born. Her first child, Jack, has his name on the second strand. In this tutorial, I'll show you how to make one for yourself. A mommy bracelet makes an awesome gift. The bracelet in the instructions is slightly different that the Ruby/Jack bracelet. Feel free to improvise a little with your materials too. 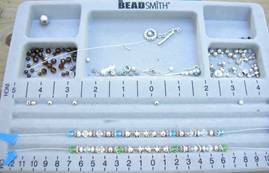 Note about bead amounts - Depending on the children's names, and the size of the mommy's wrist, you may need more or fewer for your particular mommy bracelet. Cut 2 10-inch pieces of stranded stringing cable. Use a piece of masking tape as a bead stop at the end of your cables. You could also use a beadstopper or an alligator clip. Start by lining up your beads on your bead board or on masking tape facing sticky side up. This makes it easy to move them around and rearrange them if you need to. Don't finish either end of your mommy bracelet yet. 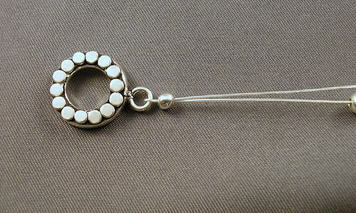 String a length, then tape or "bead stop" the other end. Do the same for the second strand. It's OK to string and restring until you're happy with the design (I usually have to rearrange a few times until I like the look). 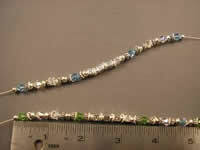 So you want the beaded portion of your bracelet to be about wrist size minus a half inch. The average wrist size of a medium sized caucasian woman to be about 6", and asian wrists tend to be about 5 ½" in my experience. 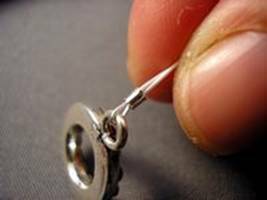 Adjust the size as necessary by adding or removing beads. You might have to readjust the design slightly. If your size is OK, take the tape off one of the ends, and remove the last bead strung. 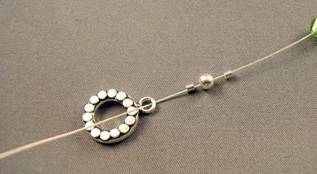 String a crimp tube, then the bead you removed, then another crimp tube, then the round half of your toggle clasp. String the end of your cable back through the crimp-bead-crimp series. Remember not to pull too tight. You want some length remaining on the other end so that you can crimp that side too. 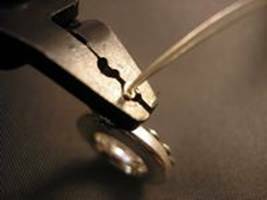 Use your crimping pliers as illustrated to crimp the first crimp tube. This is the first part of crimping a crimp tube. You aren't done yet with that crimp tube. Next we fold it. 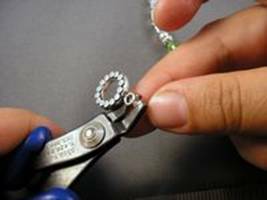 Next, use the front part of your crimping pliers to fold over the crimp (see below). If you crimped the tube correctly, it should look like the crimp tube below. Adding a crimp cover is more more looks than for security so feel free to skip this step if think the crimp looks fine as is. Adding a crimp cover makes it look more professional but that's a matter of opinion. 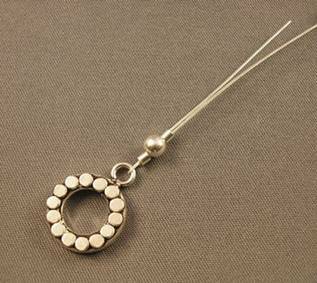 If you want to use a crimp cover, it will look like the crimp is a silver bead. If using, place the crimp cover so it wraps around your crimp. Note: Use only the amount of pressure needed to close the crimp cover. Using too much pressure will squash the cover and make it look like a smushed bead. Phew! That whole crimping business might seem like a lot of work but it goes pretty quickly. Now do that whole crimping procedure again with the second strand of beads. Trim your cables with flush cutters. You want to trim them so the end doesn't show if at all possible. This is your last chance to check your sizing. I'm telling you this because I have (multiple times) messed up my sizing somehow and had to restring whole bracelets. Not fun! 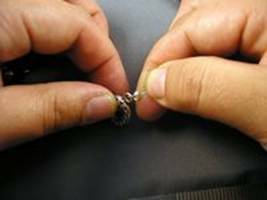 So take the time now to doublecheck that your bracelet is sized correctly and will fit the wrist of the lucky lady receiving the bracelet. 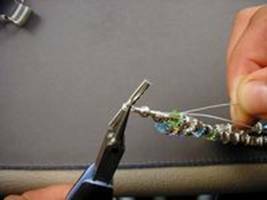 For the other end of your bracelet, you need to merge the two strands into one so that the toggle will fit through the other end of the clasp. 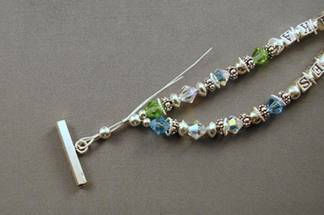 Do this by removing the last bead on each strand, slipping a tiny sterling bead onto each end, then sliding one of the removed beads onto both cable strands. Still stringing onto both strands, string a crimp tube, the other removed bead, then the last crimp tube. String the cables back through the bead crimp bead series. 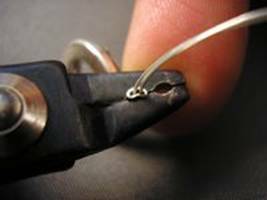 Use your round nose pliers to ease the cable tight. This takes some practice. Crimp and cover your crimps the same way as the other end.